Iron Maiden have teamed up with German-based model company Revell to produce a limited-edition version of the band’s plane Ed Force One. 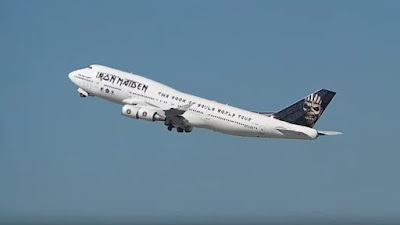 “As soon as we knew that Bruce would be piloting the plane for Iron Maiden’s world tour,” says Global Merchandising Services’ licensing manager Jens Drinkwater, “we knew that we had to do something special to celebrate the occasion, and Revell are an obvious partner for this fantastic collaboration. No release date has been revealed for the project, but Revell’s Thomas Randrup explains the model will appeal to both fans and collectors alike. The real Ed Force One recently rejoined the UK band’s tour following an accident at a Santiago, Chile airport just two weeks into the trek. The March 12 incident saw the port side engines damaged while the Beoing 747 was being towed for refueling, which required the replacement of both port side jet engines at a cost of around four million dollars each. Iron Maiden wrapped up the South American leg of The Book Of Souls world tour last week and have returned to North America for dates starting March 30 at New York’s Madison Square Garden.